For my collection, I derived inspirational details from the natural elegance and patterns of the sea. I have used bright colored fabrics and hand embroidered appliqués for an impressionistic interpretation of marine life. This collection is meant for the bold woman who would wear daring silhouettes. Sleeveless lime green bubble dress. 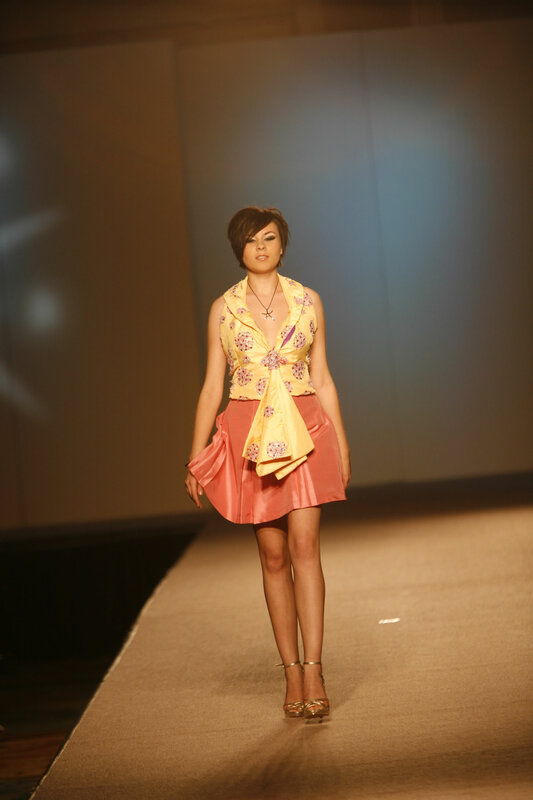 Yellow halter collar top with belt and mauve pleated skirt. Olive strapless dress with asymmetrical layers. Light blue strapless top and a blue asymmetrical skirt. Coral strapless dress with asymmetrical layers on skirt. Midnight green strapless dress with strap. Midnight blue strapless top and bubble skirt. Light green strapless top with draped long skirt and train.